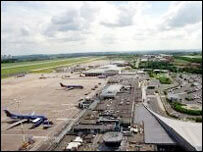 A row is set to break out over plans to change East Midlands Airport's name to incorporate Nottingham. In a controversial move, the airport will now be known as Nottingham East Midlands Airport. This is despite the airport lying in Leicestershire and the nearest major city being Derby. Airport managers have been under pressure to change the name because the term East Midlands is considered too vague and not recognised overseas. One Derby MP has already crticised the move for undermining attempts to give the East Midlands a stronger identity. The airport is located at Castle Donington in Leicestershire but has a Derbyshire postcode and is listed by the Air Transport Association as being in Nottingham. Each city had worried that it might suffer if the airport is named after one of the others. Managing Director Graham Keddie made the announcement on Tuesday, emphasising the decision came after long deliberations. He said that exhaustive research had shown Nottingham had by far the highest international profile of any East Midlands city. He added: "Nottingham is the only city in the region that is widely known. We conducted months of research, including talking to passengers from overseas. "Time and time and time again, Nottingham was the name that came up. "I'm afraid Leicester and Derby just didn't register. "Maybe it's the Hollywood effect and the myth of Robin Hood, or perhaps it is because Nottingham is the biggest city we have in terms of size." The MP for Derby North, Bob Laxton, described the name change as 'daft' and 'confusing'. He felt the move it would undermine the work that has been carried out to ensure people further afield do know the position of the East Midlands. He said: "One of the things a number of people and organisations have been trying to do is get some identity for the East Midlands. "This is hardly going to help. I just think the whole thing is daft." Budget airline BMIbaby, based at the airport, had campaigned for a change and had already used Robin Hood in its advertising. Airport staff said the change would take effect immediately but it could be a little while before passengers began to see this. Meanwhile, Nottingham Airport, a far smaller general aviation airport based at Tollerton, says it will seek legal advice about whether EMA can use the word "Nottingham". Air traffic operator at Nottingham Airport, Dave Tower, said "aviators could become confused about who to call and what radio frequencies to use". 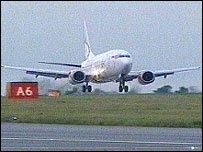 This concern was dismissed by a spokeswoman from East Midlands Airport.